Now with plenty of time under testing I am ready to give my verdict on the Caffelatex sealant. Let’s cover a few of the basics of the product before we go on, just as a refresher. CaffeLatex is a synthetic latex sealant. This differs from other popular sealants that are latex in that Caffelatex does not have any ammonia in it. Ammonia has been shown to be detrimental to bare aluminum by corroding it, and thus weakening the rim structure. So you won’t be taking a risk with using CaffeLatex. It also is nicer to your tire casings because of this. CaffeLatex also foams up inside your tires when they are rotated. Other sealants pool against the outer part of the casing due to centrifugal force, but Caffelatex claims its sealant will also protect sidewalls better due to the foaming action. The foaming action is quite easy to verify and usually manifests itself by puffing out some foam if you release some air to adjust pressure mid-ride. (You can also see it in a clear container, if you care to check it out, by shaking some CaffeLatex up.) The sealant will pool up once again after it has set dormant for a bit. CaffeLatex boasts life span of up to 12 months, but this can vary depending upon several climatological and user parameters. They suggest checking the level of sealant in your tires every two months. The temperature range for use is listed as -20 to +50C. It should be noted that Effetto Mariposa also sent along an Injector Kit, valve stems, along with the 1000ml size of sealant. I will mention the valves and injector kit as we go along. In all cases but one I added the sealant in by means of the CaffeLatex injector which worked flawlessly. It will screw onto the valve stem and push the sealant right past the valve core if you want. This also works on tubes that you want to make thorn proof. With a bit of practice, you can add sealant to tires without spilling a drop. Nice! The one set of tires I did not use the injector on I added sealant by means of my old, cobbled injector system. I won’t be using that method any longer! Long Term Performance: I started using this sealant late in March and in every tubeless set up since then. All set ups have required minimal pressure maintenance and still have sealant inside that is foaming up and doing its job. This isn’t necessarily outstanding for where I live, but I will continue to monitor its performance over the rest of the year. Typically, a Stan’s set up will last about 8-10 months for me here, so CaffeLatex is on track to go at least that long. At any rate, there is no need to worry after 4 months in the tires I first set up. Sealing is an issue that is harder to gauge. I did get a puncture and had it seal up on a ride that I noticed, but typically if you do not notice anything wrong here, the sealant is doing its job. We have many Honeylocust trees here and the thorns from these trees raise havoc with tires. If your sealant is working though, you’ll never know about the thorns until you change your tires out. So, I believe the sealant is doing a great job of sealing punctures I should be suffering from, but I am not due to the sealing properties of this product. I will also be checking through my tires to verify this as I pull them off later on. I did have a puncture in a tubed tire seal up with CaffeLatex though and that was from a thorn. CaffeLatex seems to play well with all my tubeless systems and valve stems. Caffelatex injects right past the valve core on all of the types I have used including the excellent CaffeLatex valves that I received. These do have removable cores though, in case you need that feature. I have not had any clogging of valve stems even though it is not uncommon for a bit of sealant to spit out while inflating or releasing pressure from a tire. 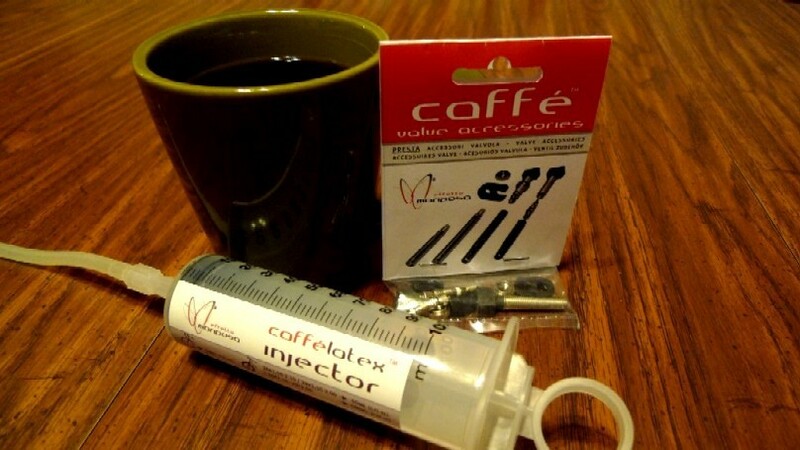 Conclusions: Given the stellar performance of CaffeLatex and its Injector and Valve Stem products, I have no negative things to say about them. I highly recommend that you try them out for yourself. The injector works, and the valve stems are solid as well. The sealant seems to be working as advertised in regards to the foaming action, and even seals punctures in tubes in my testing, so you don’t even have to be a tubeless devotee to gain benefit from this product. The fact that the solution has no ammonia in it to corrode your rims is another bonus. Effetto Mariposa has hit the ball out of the park with this sealant. It is good stuff Really good! So the tubeless revolution is starting to really take a hold of the 29″er movement and questions come up all the time about sealant. Which sealant is best? What sealant do you use? Well, I have used several sealants and I am quite smitten with this Caffelatex stuff so far. Here’s what I have been up to with it and how it has performed in various applications. Caffelatex has gone into all of my latest tubeless tire testings. Tubeless Tires: The obvious application here. I have injected the Caffelatex sealant with their handy little injector unit into several tubeless tires of late. The sealant seems to keep the casings air tight, and I have had no issues with it drying up so far at all. One of the benefits that Effetto Mariposa makes about this product is that it foams up inside the tire, allowing the sealant to protect sidewalls more effectively than other sealants might. Does it work? Well, while I have not gotten my X-ray vision glasses to work since I was a kid, (Can I get my money back? ), I can not say with authority that Caffelatex is foaming up inside my tires. I can tell you that in every tire that has Caffelatex in it, when I adjust air pressure, and the valve stem is at its highest position (12 o’clock), that a little Caffelatex foam spits out of the valve stem when I open it. In my opinion, the claim is true. What about sealing punctures? I can say that I have been running over stuff with impunity, and nothing has caused a flat so far. I did get a low tire on a couple of occasions. I will not say that I discovered a puncture that had sealed, but after re-inflating both tires, they held air pressure as all of the other Caffelatex injected tires have. I am left to believe that it has saved me a couple flats at least. Tubed Tires: With the injector kit, I can inject Caffelatex into tubes for a tubed set up. I have done this and sealed a slow leaker tube which is still holding air just fine. (It was mounted in a tire when I did this.) I have done up a few tubed tires with this sealant and again, no detrimental issues, no negatives so far. I find that the Caffelatex is easily injected right past the presta valve stems and I do not have to have removable core stems on the tubes to use this sealant. I tried the Caffelatex on a tubular tire, but the tire was so old, it wasn’t possible for the sealant to get all the holes in the inner bladder to seal up, so I have not had any success with this yet, but I see no reason why it wouldn’t perform as well as it has in tubes and tubeless tires. So far, two big thumbs up on this sealant. Stay tuned for a final review in about a month.